Cherry Mobile treated their "Flare" line-up with an HD-display device - the Cherry Mobile Flare HD. And if you think that Cherry Mobile Apollo is the suprise hit among all the "Cherries", you haven't seen them all yet. When it comes to branding, Cherry Mobile puts all their value-for-money phones under the "Flare" moniker, and this one is not an exception. Having said that, most of the features of this new phone don't differ much from the rest of the Cherry phones- 4GB RAM, 1GB RAM, expandability option...blah blah blah. But the screen might suprise you, it carries in a sparkling 1280 x 720p HD display that could sum up to 342 ppi (that's even crispier than the Apollo phone). On top of that, the 1.2GHz quad-core MTK6589 quad-core processor will keep things working. Cameras are rated 12-megapixel and 5-megapixel (back and front). The Cherry Mobile Flare HD will be available in the first quarter of 2014 with price "lower than Cherry Mobile Apollo." This is undoubtedly one of the highly anticipated phones for next year. 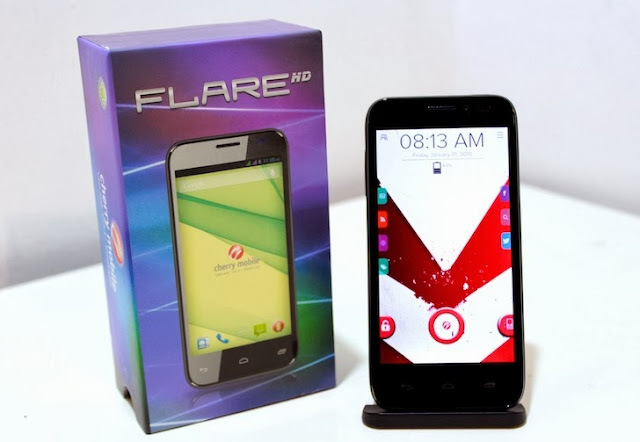 And with the projected price standpoint, Flare HD will definitely attracts a bigger share in the mobile market.